At the moment, thanks to a couple of simultaneous deals, you get into an unlocked Samsung Galaxy S8 for as little as $425 or less (S8+ for $525 or less). 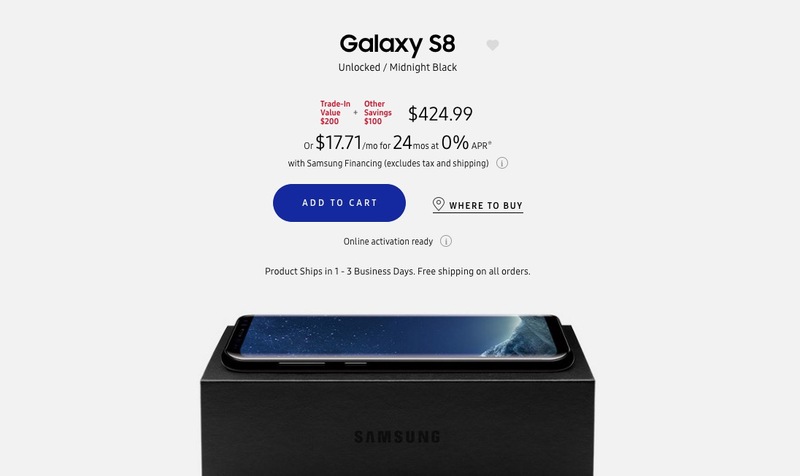 The combination of Samsung’s $100-off deal on their unlocked models, plus an instant trade-in discount depending on what you have available, has made this one of the best deals you might ever find on the S8 or S8+. As you guys know, the unlocked Galaxy S8 and Galaxy S8+ are currently discounted by $100 almost everywhere they are sold. That puts the unlocked S8 at $625 and the S8+ at $725. Those are already good discounts. However, Samsung is running an additional discount for smartphone trade-ins when you buy any S8 from them directly, including the unlocked models. As long as you trade-in any smartphone running iOS or Android, they’ll give you at least $200 off upfront. It works like this. You hit that link below, decide which phone you want, then tell Samsung what you plan to trade-in. Depending on the phone, you’ll get at least $200 off, but you could get upwards of $350 or $300 off if you trade-in a S7 Edge or Note 5. The discount is applied immediately to your order and then sent as you checkout. Once your new phone arrives, you’ll then put your trade-in device in the box and return it quickly to avoid Samsung charging you back the discount they gave. So yeah, you get the discount immediately and get to keep your phone until your new one arrives. This isn’t one of those prepaid-card after-the-fact scams. So even if you have an old as hell smartphone, Samsung will give you $200 for it as long as it’s not on a blacklist, powers on, has normal wear and tear conditioning, no cracked screen, and no water damage. Basically, you just need a working smartphone that runs Android or iOS, even if it’s 4 years old. This is a limited time offer, so jump on it.